This is a view through the first floor showing the illuminated canopy over the dining table and the Christmas tree. Through the portal, you can see on into the living room. 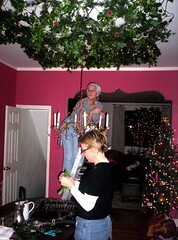 Below, D’Arcy (foreground) and her friend Beth (on the ladder) rig a canopy of greens suspended in a net of twinkle lights over the dining room table. This entry was posted on Monday, December 25th, 2006 at 11:03 pm and is filed under Uncategorized. You can follow any responses to this entry through the RSS 2.0 feed. You can leave a response, or trackback from your own site.